First of all I would like to make one thing quite clear. … I never explain anything. Storm signals are up at number 17. Bit of heavy weather brewing there. 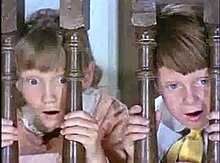 Mary Poppins is a 1964 musical live-action/animated film about a magical nanny, played by Julie Andrews, who comes to work for a cold banker's unhappy family. Directed by Robert Stevenson. Written by Bill Walsh and Don DaGradi, based on the novel by P. L. Travers. As I expected. "Mary Poppins, practically perfect in every way." Reading her magical tape measure, after the children ask her to measure herself. In every job that must be done, there is an element of fun. You find the fun and snap! [snaps her fingers] The job's a game. Close your mouth please, Michael, we are not a codfish. Sacked?! Certainly not, I am never sacked. Kindly do not attempt to cloud the issue with facts. King Edward's on the throne; it's the age of men. It's 6:03 and the heirs to my dominion are scrubbed and tubbed, and adequately fed. And so I'll pat them on the head, and send them off to bed. Ah, lordly is the life I lead. He's brought to wrack and ruin in his prime. In short, you have a ghastly mess! Oh, George, you didn't jump into the river. How sensible of you! [sings] Our daughters' daughters will adore us and they'll sing in grateful chorus, "Well done, sister suffragettes." [sings] Though we adore men individually, we agree that as a group they're rather stupid. Oh, It's you. Hello. … Number 17 Cherry Tree Lane, you say? Alright. … Come on with me.… Here we are, 17 Cherry Tree Lane. Home of George Banks, Esq. [hears yelling inside] Hello, hello, hello. Admiral's right, heavy weather brewing at number 17 and no mistake. Opening comments to viewers of the film, breaking the fourth wall. Winds from the east... Mist comin' in... Like something's a brewin', about to begin... Can't put me finger on what lies in store... But I feel what's to 'appen, all 'appened before...! Not Royal Academy, I suppose. Still better than a finger in the eye, ain't they? What did I tell ya? There's the whole world at your feet. And who gets to see it? But the birds, the stars, and the chimney sweeps. Goodbye, Mary Poppins, don't stay away too long. Admiral Boom: [observes the long queue of want-to-be nannies] Ghastly looking crew, I must say! Uncle Albert: The other day, when it was so cold, a friend of mine went to buy some long underwear. The shopkeeper said to him, "How long you want it?" And my friend said, "Well, from about September to March." Old Crone: Come with me, my dears. Granny'll hide you! but that's going a bit too far, don't you think? Admiral Boom: Time Gun ready? Mr. Binnacle: Ready and charged, Sir. Admiral Boom: Three minutes and six seconds. Mr. Binnacle: Aye, aye, sir. Bert: [to the audience] What he's famous for is punctuality [touches his nose as he says this]. The whole world takes it's time from Greenwich. But Greenwich they say, takes it's time from Admiral Boom. [calling up to the admiral] What cheer, Admiral? Admiral Boom: Good afternoon to you, young man. Where are you bound? Bert: Number 17. Got some parties who want to see it. Admiral Boom: Enter that in the log. Admiral Boom: A word of advice, young man. Storm signals are up at number 17. Bit of heavy weather brewing there. Bert: Thank you sir! Keep an eye skinned. Winifred: I'm sorry, dear, but when I chose Katie Nana, I thought she would be firm with the children. She seemed so solemn and cross. George: My dear, never confuse efficiency with a liver complaint. Jane: [reads an ad she and Michael wrote] Wanted: a nanny for two adorable children. George: Adorable — well that's highly debatable, I must say. Michael: That's the part I put in! Michael: I put that in, too. Michael and Jane: Jane and Michael Banks. Michael: Perhaps it's a witch. Jane: Of course not. Witches have brooms. Mary Poppins: I beg your pardon, are you ill? Bert, what utter nonsense. Why do you always complicate things that are really quite simple? Jane & Michael: Please, Mary Poppins, please? Mary Poppins: I have no intention of making a spectacle of myself, thank you. Bert: I'll do it myself. Bert: A bit of magic. Michael: A bit of magic? Bert: It's easy. You think. You wink. You do a double blink. You close your eyes... And jump. Jane: Is something supposed to happen? Bert: Mary Poppins, you look beeeeautiful. Mary Poppins: Do you really think so? Bert: I cross my heart you do, like the day I met ya. Mary Poppins: You look fine too, Bert. But cream of the crop, tip of the top. It's Mary Poppins, and there we stop! Phoebe's delightful, Maude is disarming. Penguins: Janice, Felicia, and Lydia. Penguins: Veronica, Millicent, Agnes, and Jane. 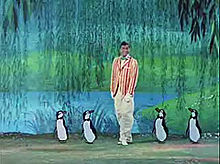 Bert and the Penguins: It's Mary Poppins, and there we stop! Horse: Oh, yes, definitely. A view halloo. Fox: View halloo?! [The horseman blows a trumpet, causing his dogs to go charge at the Fox.] Faith and begora, it's them redcoats again! Gentleman: There probably aren't words to describe your emotions. Mary Poppins: On the contrary, there's a very good word. Am I right, Bert? Bert: Tell 'em what is it. Mary Poppins: Right. Iiiiit's Supercalifragilisticexpialidocious. Mary Poppins: You know, you can say it backwards, which is dociousaliexpilisticfragicalirupus, but that's going a bit too far, don't you think? Busker: One night I said it to me girl, and now me girl's me wife. [Wife hits him with tambourine] Ow! And a lovely thing she is, too. Winifred: As a matter of fact, since you hired Mary Poppins, the most extraordinary things seem to have come over the household. Winifred: Take Ellen for instance. She hasn't broken a dish all morning. George: [uninterested] Really. Well, that is extraordinary. George: Ellen, stop making that offensive noise. And shut the window. That bird is giving me a headache. Ellen: Yes, sir! [to the bird] Quiet! You're giving the master an 'eadache. Jane: Mary Poppins taught us the most wonderful word. George: What on Earth are you talking about? Superca — Super — or whatever the infernal thing is. Jane: It's something to say when you don't know what to say. George: Yes, well, I always know what to say. George: Have this piano repaired. When I sit down to an instrument, I like to have it in tune. Winifred: But George, you don't play. George: Madame, that is entirely beside the point! Bert: Speaking of sight, it reminds me of me brother. He's got a nice cushy job in a watch factory. Uncle Albert: In a watch factory? What does he do? Bert: [laughs] He stands about all day and makes faces! Uncle Albert: [laughs] He makes faces in a watch factory! Bert: Speaking of names, I know a man with a wooden leg named Smith. Uncle Albert: What's the name of his other leg? Bert: Uncle Albert, I got a jolly joke I save for just such an occasion. Would you like to hear it? Uncle Albert: I'd be so grateful. Bert: Righto. Well it's about me granddad, see, and one night he had a nightmare. So bad, he chewed his pillow to bits. To bits. The next morning, I says, "How do you feel, Granddad?" He says, "Oh not bad, a little down in the mouth." [laughs] I always say there's nothing like a good joke. Uncle Albert: And that was nothing like a good joke. George: [As they arrive at the bank where George works] We must be on our best behavior. Michael: But I thought it was your bank. George: Well, I'm one of the younger officers, so in a sense it is. Sort of. Michael: [about his tuppence] I want it to feed the birds. Mr. Dawes Sr: Carry on, Banks. Bert: In the flesh and at your service. Bert: Oh. Perhaps a smudge or two? 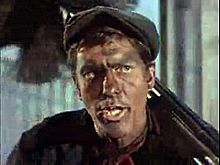 It so happens that today, I'm a chimney sweep. Jane: Oh, Bert, we're so frightened! Bert: Now, now, don't take on so. Bert will look after you. Like I was your own father. Now who's after you? Bert: Let's sit down. You know, begging you pardon, but the one who my heart goes out for is your father. There he is in that cold, heartless bank day after day, hemmed in by mounds of cold, heartless money. I don't like to see any living thing caged up. Jane: Father? In a cage? Bert: They makes cages in all sizes and shapes, you know. Bank-shaped some of 'em, carpets and all. Jane: But Father isn't in trouble, we are. Bert: Oh, sure about that, are you? Look at it this way. You've got your mother to look after you. And Mary Poppins and Constable Jones and me. Who looks after your father? Tell me that. When something terrible happens, what does he do? Fends for himself, he does. Who does he tell about it? No one! Don't blab his troubles at home. He just pushes on at his job, uncomplaining and alone and silent. Michael: He's not very silent. Jane: Michael, be quiet. And Bert, do you think father really needs our help? Bert: Well, Jane, it's not my place to say. [the three of them stand up] I only observe that a father can always do it with a bit of help. Come on, I'll take you home. When you're with a 'sweep, you're in glad company. Bert: [sings] Never was there a more happier crew. Both: Than them what sings Chim Chim Chiree Chim Chiroo! Chim Chim Chiminy Chim Chim Chiree Chim Chiroo. George: Just a moment, Mary Poppins. What is the meaning of this outrage? Mary Poppins: I beg your pardon? George: Will you be good enough to explain all this? 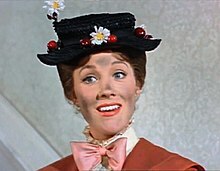 Mary Poppins: First of all I would like to make one thing quite clear. Mary Poppins: I never explain anything. Bert: Say no more, Gov'ner. [sings] You've got to grind, grind, grind at that grindstone... Though childhood slips like sand through a sieve... And all too soon they've up and grown, and then they've flown... And it's too late for you to give — just that spoonful of sugar to 'elp the medicine go down — the medicine go dow-own — medicine go down. [speaks again] Well, so long, Gov'ner. Sorry to have troubled you. Mr. Dawes Jr: In 1773, an official on this bank unwisely loaned a large sum of money to finance a shipment of tea to the American colonies. Do you know what happened? George: Yes, sir, I think I do. As the ship lay in Boston Harbor, a party of the colonists dressed as red Indians boarded the vessel, behaved very rudely, and threw all the tea overboard, making the tea unsuitable for drinking. [jokingly] Even for Americans. Mr. Dawes Jr: Precisely. The loan was defaulted. Panic ensued within these walls. There was a run on the bank. Mr. Dawes Sr.: From that time to this, sir, there has not been a run on this bank... UNTIL TODAY. A run, sir, caused by the disgraceful conduct of your son, do you deny it? Mr. Dawes Sr.: Well, Banks — have you anything to say for yourself? Mr. Dawes Sr.: Confound it, Banks! I said do you have anything to say! George: (starts to laugh) There's just one word, sir. Mr. Dawes Sr.: What are you talking about, man? There's no such word. George: Oh, yes. It is a word. A perfectly good word. Actually, do you know what there's no such thing as? It turns out, with due respect, when all is said and done, that there's no such thing as you! Mr. Dawes Sr.: Impertinence, sir! George: Speaking of "Impertinence," would you like to hear a perfectly marvelous joke? A real snapper. Mr. Dawes Sr.: "Joke?" "Snapper?" Mr. Dawes Sr.: The man's gone mad! Call the guard! George: Supercalifragilisticexpialidocious! I'm feeling better all the time! Mr. Dawes Jr.: Banks, don't you dare strike my father! George: [hands Dawes Sr. the tuppence] There's the tuppence. The wonderful, faithful, Supercalifragilisticexpialidocious tuppence. Guard it well! Bye-bye! Mr. Dawes Sr.: Banks, where are you going? George: I don't know. I might pop through a chalk-pavement picture, and go for an outing in the country. Or I might seize a horse off a merry-go-round and win the derby. Or I might just fly a kite. Only Poppins would know! Mr. Dawes Jr.: Mad as a march hare. Mr. Dawes Jr.: Ah, there you are, Banks. I want to congratulate you. Capitol bit of humor. "Wooden leg named 'Smith!'" [laughs and pauses] Or Jones. Whatever it was. Father died laughing. George: Oh, I'm so sorry, sir. Mr. Dawes Jr.: Oh, no. Nonsense. Nothing to be sorry about. Never seen him happier in his life. [hands George back the flower badge] He left an opening for a new partner. Congratulations. George: [delighted] Thank you, sir. Thank you very much indeed, sir! On the origins of Supercalifragilisticexpialidocious.